If Austin weren’t always so hampered by short-sighted politicians and citizens in a tizzy against virtually everything, it would now be the best test case for land use paradigm change of emerging mid-sized American cities. This article explores Austin’s underutilized urban geography before discussing future lifestyle, economic and environmental benefits that can potentially be gained, not by continuing to embrace sprawl, but by optimizing density via infill. Infill development generally occurs by rezoning formerly vital neighborhoods that have been lost over decades of change, which instigates private investment. An infill project should be appropriately scaled and leave a neighborhood significantly better off than before. Furthermore, transportation systems are pulmonaries through which any urbanized area breathes while its downtown is the heart that pumps its vitality. They are inextricably entwined; if one underperforms, stress is added to the other, which then adds stress to the other – until soon the whole urban structure begins collapsing into itself. The process of reinstituting streetcars running right “up the middle” will be facilitated by the near perfect grid of existing streets. With destinations like the CBD, the State Capitol Complex and UT, the market clearly exists for this. The potential to densify many centralized zones is tremendous. 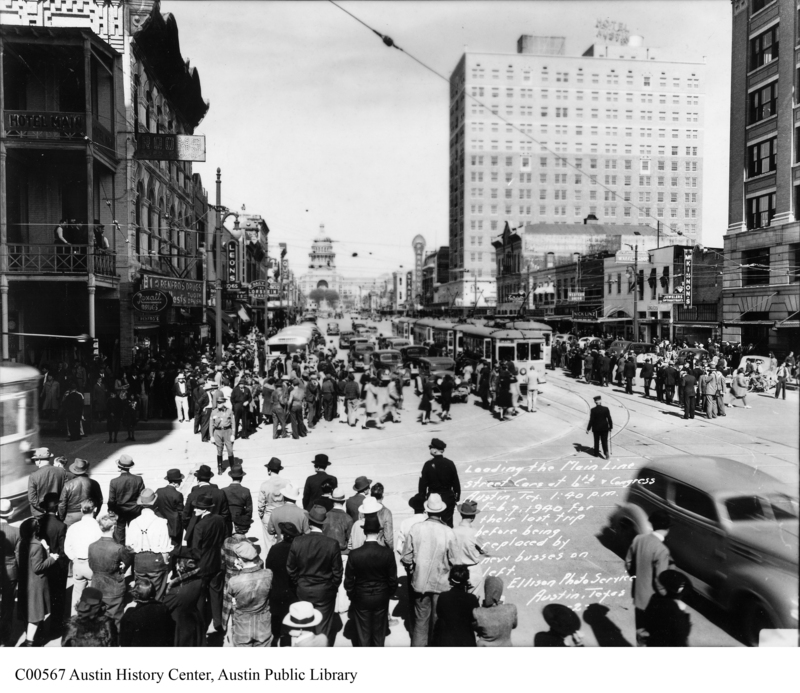 Streetcars can once again serve Austin’s most intense population concentrations while unlocking development potential of areas between and beyond. Today, alas, Austin is not unique when it comes to having crosstown arterials that are lined by retail and low-density buildings. These auto-dominated thoroughfares divide neighborhoods and deny pedestrian corridors that could instead be interconnecting adjacent neighborhoods. Redeveloping these arterials into medium density, transit enabled, walkable, mixed-use continuous corridors could provide housing for thousands of people. While many cities have brownfield sites due to former industrial land uses, Austin has “black holes” in the form of changed land uses. For example, the State of Texas owns many tracts of land around the city. As state institutions move, consolidate or disappear, land will become available for redevelopment by the private sector, ultimately filling most of the urban black holes. The zones adjacent to and north of the State Capitol Complex are totally automobile-oriented and, therefore, presently lifeless both day and night. A great opportunity exists to inject mixed-use development and urban life into this huge (80-block) area. Many good examples of graceful increases in density and, of course, the subsequent corresponding increase in property values already exist in Austin. Central Park (38th and Lamar) and The Triangle are already established while Plaza Saltillo (the site of abandoned rail switching yards just east of the CBD and IH-35) and Mueller are currently being redeveloped as walkable, mixed-use New Urbanist communities. 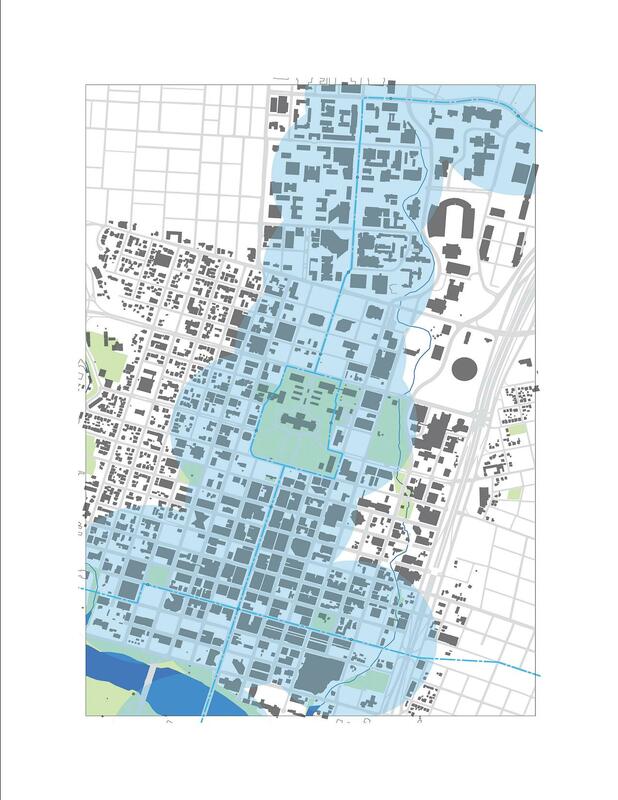 Others include the University Neighborhood Overlay that favors dense student housing, and the Rainey Street neighborhood at the intersection of IH-35 and Lady Bird Lake. The Central Business District of Austin has traditionally been the center of the region. Very recently it has again become the focus of urban living and, as a result, the CBD is reemerging as a place of retail activity while also experiencing a hotel building surge. 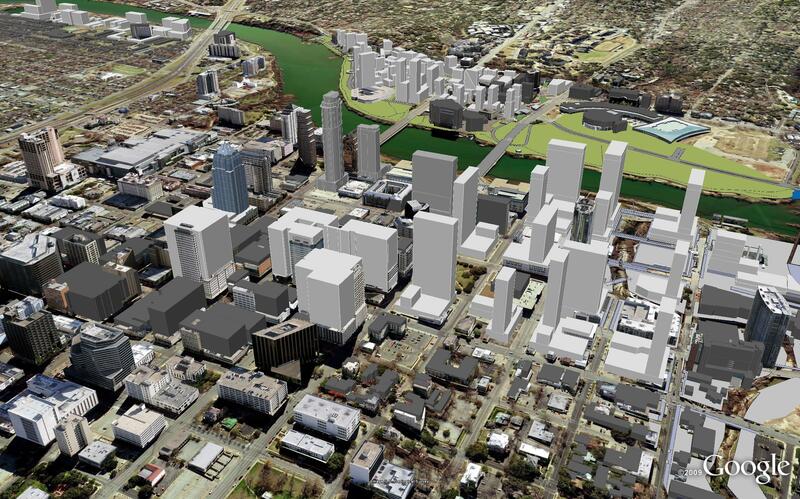 But two major problems exist: first being the brutal superimposition of IH-35 over historic East Avenue; the second being the yet-unrealized opportunity for approximately 91 acres (52 city blocks) of downtown redevelopment potential on the shores of Town Lake (AKA Lady Bird Lake). Because the latter is Austin’s most important amenity and most valuable real estate, it has the potential to become Austin’s “green lung” if done right. Encouraging sustainable development of privately-owned land along its edges is a short-cut to enhancing tax base and reducing carbon dioxide emissions. Thousands of people could live and work here, and the whole Central Texas Region would be infinitely better off as a result. Yes, there is, of course, heartburn associated with this kind of change. But in the end thousands of people will be able to walk to their destinations. And, by living closer to where they work and play, literally tens of thousands of people will begin reducing the vehicle miles they travel rather than crowding streets with more commuter cars. 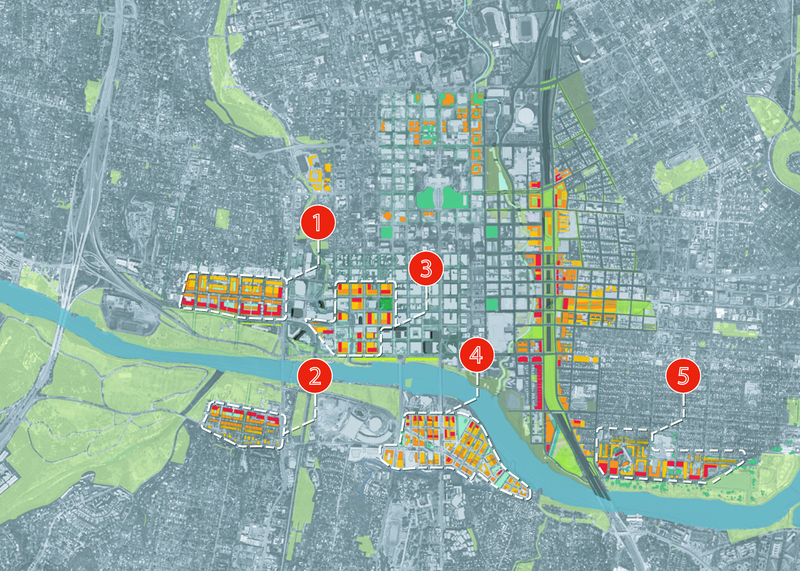 With that said, let us now explore the benefits that could be gained by optimizing Austin’s density on just a few opportune sites. Length of new lake edge made open and accessible to the public: 3.1 miles. The Austin Metropolitan Region is ever-verging upon violating the Clean Air Act. When this does indeed occur, we the people will have no choice but to densify in a manner quite similar to this proposal. It’s always better to act now rather than reacting later. While the five county regional vision of Envision Central Texas points the way towards a sustainable future, Austin needs visionary leadership and cooperation among jurisdictions that enables compact, walkable towns and neighborhoods linked by rail transit that is structured around the downtown core. The conditions are in place for paradigm change, to create a new “Geography of Opportunity” for our Central Texas Region. Great stuff. Thanks for posting. Demonizing density (aka. ‘condos’ and ‘development’) is misdirected, ideologically trite, and uninformed. Facilitating sprawl by hindering dense residential/transit solutions is socially and environmentally irresponsible. I sympathize with our local politicians, though. Once elected, being a “urban” visionary comes with a price: alienating constituent members of Austin’s political/voting machine – largely the same citizens who get in a tizzy against virtually everything. I’ve always found it interesting that the biggest promoters of the Hill Country Conservancy – arguably one of the most important organizations towards curbing sprawl in Central Texas – comes from people that embrace dense urban core development. It sure would be great if Prof. Black would just come out and say it: the Red Line is killing our chances at great urban rail.